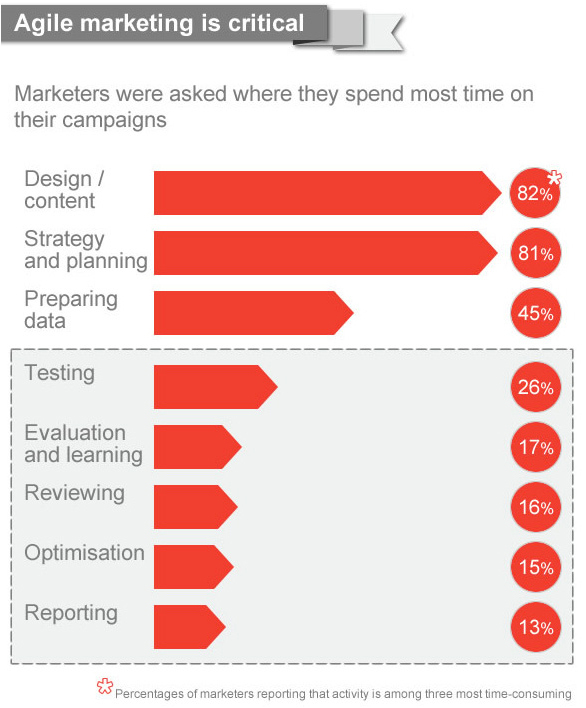 eConsultancy recently released their 2014 Cross-Channel Marketing Report and the research makes one thing crystal clear: agencies are too preoccupied with campaign planning, design and content content creation, often at the expense of testing and optimization. Research conducted by Oracle Responsys found that the typical consumer spends 30 seconds or less absorbing digital marketing content online at any one time, yet over half of marketers say that they spend most time on strategy and planning. The least amount of time is spent on testing, learning and optimization – key requirements of any agile marketing strategy. With the abundance of data and real-time solutions, testing and optimization should no longer be an afterthought. Instead of burning hours setting up and managing campaigns, marketers should be leveraging tools and technology to automate or simplify creative workflow and campaign management (like Adventive). Testing is not about reinventing the creative wheel so to speak, it's about iterative improvements and updates. These incremental changes are pivotal to the ROI of any campaign, and often can mean the difference between success and failure.